So I may have forgotten about this last month because I'm forgetful and easily distracted and busy because I have a job and actually do things with my days now. In my previous Favorite Things I forgot to mention Lifescouts. Watch the video for an explanation of what Lifescouts is because I'm too lazy to type in all of the information. I may not like Alex Day (aka nerimon on YouTube) sometimes (because he does have occasional dickishness... which I mostly enjoy watching), but he did have a good idea. I've heard that there were people who didn't like this that were big fans of the show, but I loved it! This is a pretty cool series on The Multiverse channel on youtube. The first season just ended, so there are 6 (about half hour long) episodes available to view. I donated to their Indiegogo to fund this series and I was more than pleased with the outcome. I hope there will be a season 2! Tomb Raider is awesome! I'm not usually one for games that involve a lot of shooting (I get ascared), but I REALLY like this one. Part of it is because the weapons are easy to use/aim and I don't find myself turning in circles trying to aim at something. Nothing more satisfying than taking the bad guys out with a headshot from my long bow. (That seems a little sadistic, I apologize.) The scenery is beautiful and the animation is spectacular. All around fun game. If you are squeamish and are grossed out by blood and violence, this isn't something you should watch. But if you don't mind it (or can get past it), this is a really good movie. I loved Jamie Foxx and Christoph Waltz in this! Seeing Leonardo DiCaprio as a bad guy was a little strange, but he pulled it off well. I may or may not have wanted to seriously hurt him... *hint: I did* After watching this I understand why it won so many awards. Quentin Tarantino is a genius... a crazy, violence fueled genius. I've been spending a lot of time on Esty lately. Mostly to buy gamer/comic type girly stuff. 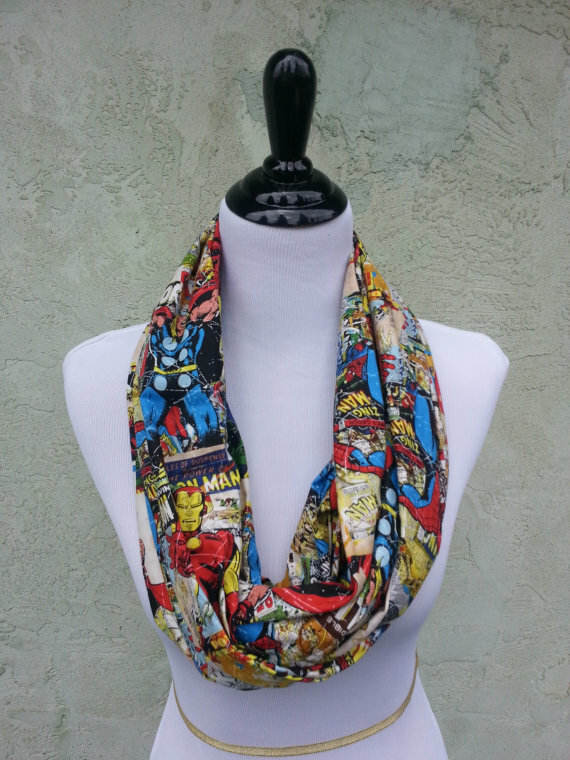 I recently purchased a scarf from Handmade Reverie and it looks awesome. If I'm looking for original, geeky accessories that will make friends jealous, etsy is the place to look for them. Know of something I should check out for next month? Leave suggestions in the comments!